Hi, this is Arca! This is my post for today, the previous one was to make it up for not posting Saturday. 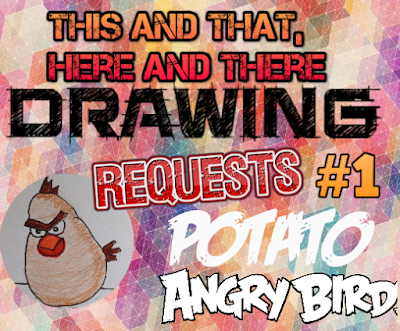 I will be asking you guys to give me requests on what to draw, and I will draw it! There are some rules, though. If you do not follow these rules in your request, I will not accept it. Do not suggest anything inappropriate. Remember that I am just a kid. No toilet or poop jokes. Suggest something ORIGINAL. This means that you may not suggest for me to draw a cartoon replica of a character that already exists. HOWEVER, you may ask me to take the character and change it in some way. Example: I will not draw the Millenium Falcon if you ask me to. But I WILL draw it with a unicorn horn and a rainbow coming out of it. No anime characters, since I do not watch any anime, so I have zero knowledge about what it is like or how to draw it. Sorry, guys! Also, no manga or kawaii either, since I do not draw that too much. As you can see above, the Potato Bird obviously has the outline of a potato and is brown. The potato itself is mostly light brown, with darker shading on the outer parts. The head feathers are pointy and dark brown. The tail feathers are flat and dark brown. It has a beak with two shades of orange and is oval-shaped. His angry eyebrows are dark brown, and his eyes are right next to each other. 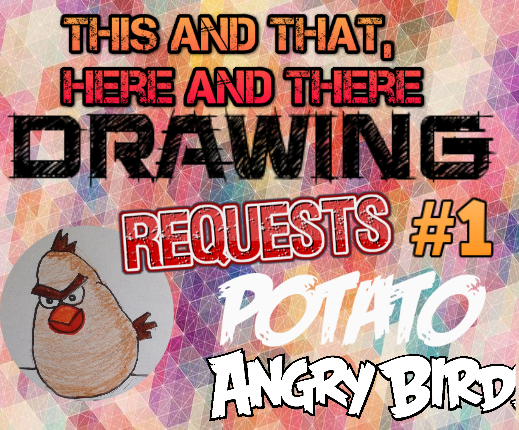 Overall, I think the potato bird turned out to be surprisingly better than I expected. Stay tuned for tomorrow's post, and a post every day until the end of July. BBYYYEEEEEEEE!! !